Bucks County Area Agency on Aging - Times Publishing Newspapers, Inc. 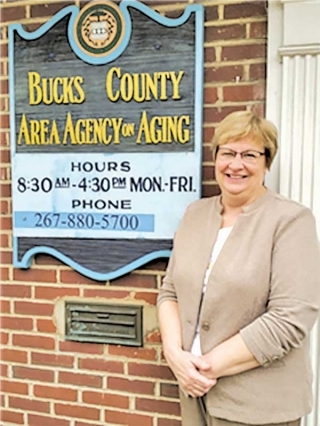 The Bucks County Area Agency provides a wide variety of services mainly to persons age 60 and above, giving priority to consumers with the greatest needs and fewest resources. The agency supports residents to stay connected to the community, provides services to help residents remain in their homes as long as possible, and advocates for the rights of residents of long-term care facilities and all older adults at risk for physical and verbal abuse, neglect, financial exploitation, and abandonment. Examples of services include: information & referral to answer questions and identify community resources; health and wellness promotion; Senior Games; nutritional services and meals; senior centers; volunteer opportunities; Medicare and related insurance counseling; transportation subsidy; employment assistance and legal aid; long-term care; advocacy for residents of nursing facilities; advocacy; and protective services. Long-Term Care services include: determining eligibility for in-home care or nursing facility services; assistance with care plan development; coordinating in-home care services; and financial assistance for adult day care, personal care tasks, adaptive equipment or home modifications. Protective and Advocacy Services include: investigating all claims of elder abuse, neglect and exploitation; helping to ensure the rights and quality of service for residents of nursing and assisted care facilities; community outreach; and access to legal counseling services. Bucks County Area Agency on Aging is located at 30 E. Oakland Ave., Doylestown, PA 18901. Call 267-880-5700, email aging@buckscounty.org or visit www.buckscounty.org.